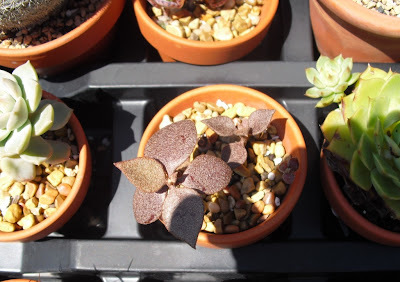 What can I say about the related genera Kalanchoe and Bryophyllum that I haven't already said about succulents in general? 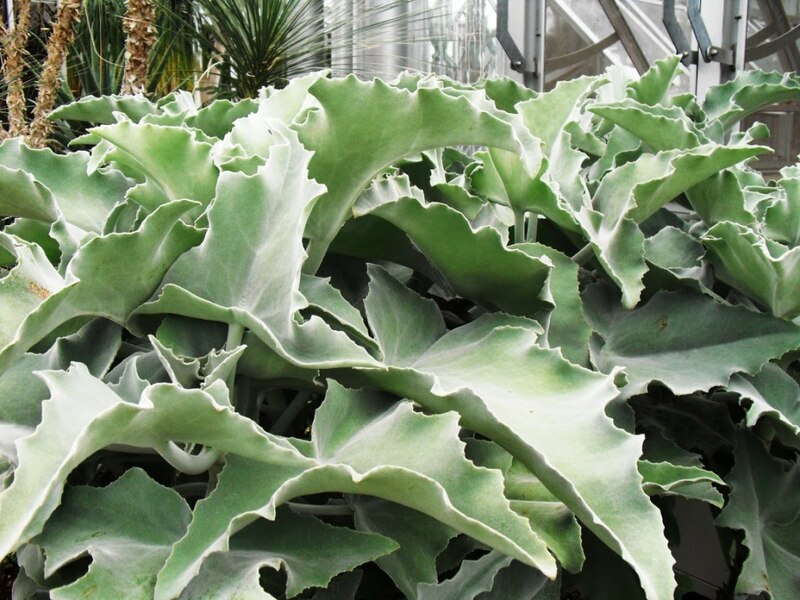 They are attractive, easy to care for, and come in a variety of shapes, colors and forms. These plants will put up with less-than-ideal indoor lighting better, than say, Echeveria. They seem equally happy under fluorescent lights, or in my south window during their winter indoors. 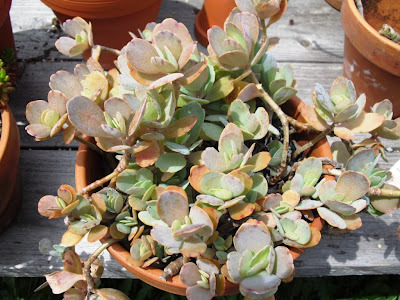 Their only downside is a tendency to drop leaves and get leggy over time, which is not uncommon among succulents. 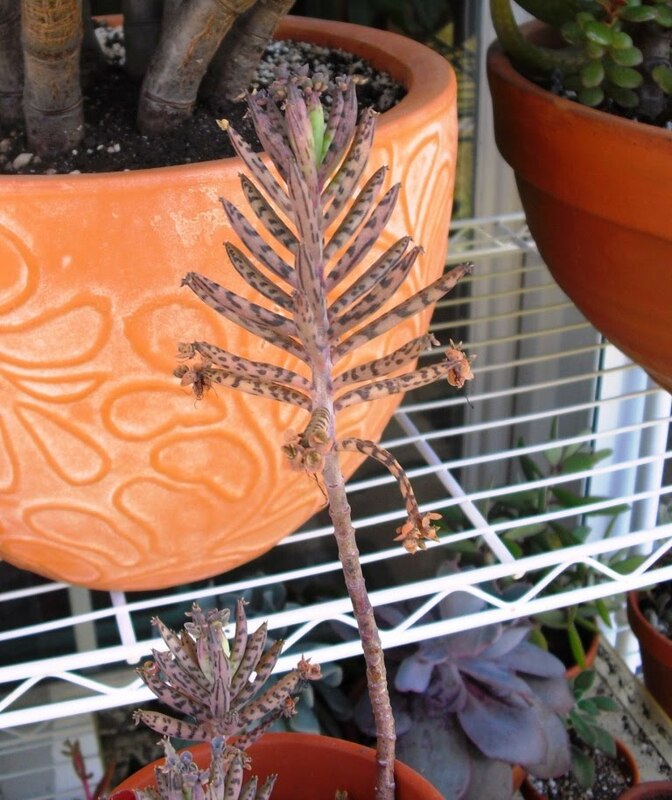 A leggy Kalanchoe tends to look like a peculiar palm tree, with a notched stem and a small crown of leaves up top. Even that has a simple remedy: Take cuttings and start anew. 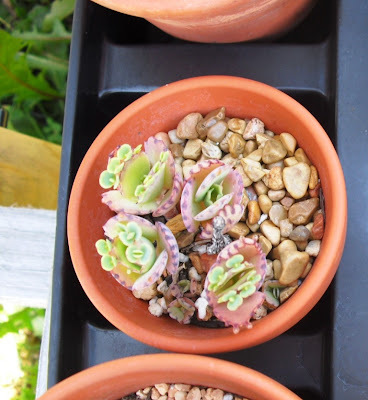 The cuttings root quickly, and the stumps that are left behind will usually sprout new growth. On the downside, they are quicker to sunburn than some other plants. They are also not the best plants if you want consistent flowering indoors (except of course for the ubiquitous Kalanchoe blossefeldiana.) I have, however, been treated to Bryophyllum flowers now and again. 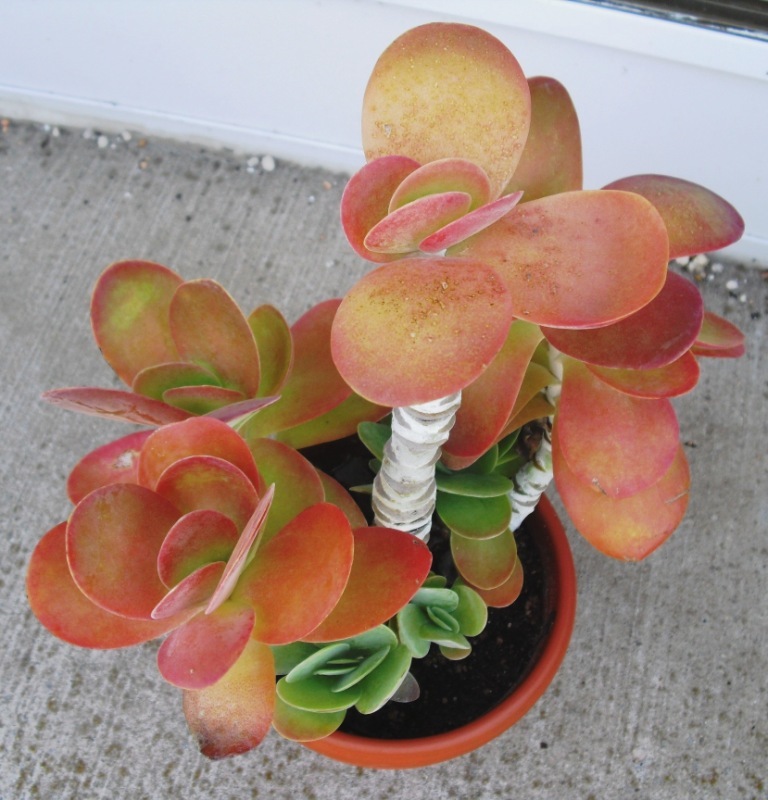 Two Kalanchoe beharensis flank a Kalanchoe orgyalis. The plant on the left sprouted from the stumps left behind when I took the cuttings that resulted in the plant on the right. More detail can be seen if this photo is clicked for the larger version. Closer view of K. orgyalis. I do find this a bit more difficult to grow than my other Kalanchoes, but I keep trying because those coppery leaves are worth it. K. beharensis 'Napoleon's Hat' This was one of those with a small crown of leaves on a tall stem, so I cut it back about three weeks ago. It has already rooted. Kalanchoe tomentosa varieties. I believe that might be K. tomentosa 'Chocolate Soldier' on the right. Two different pots of Kalanchoe beharensis 'Nudum.' This one has also been a bit difficult for me. 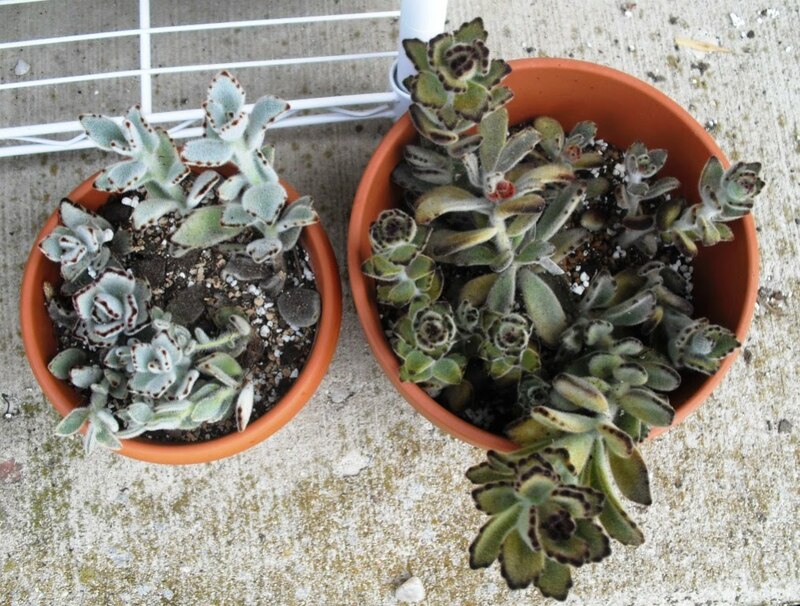 I started out with a couple of large cuttings in 2005, which was slow to root, and then never flourished. But I was able to salvage some leaves, which produced the two smallish plants seen here. Bryophyllum tubiflorum, one of the Mother-of-Thousands species. You can see the plantlets on the leaf tips, ready to drop and cause mayhem. I really don't mind having these pop up in my other plants from time to time, but I can see how they can cause problems for other growers, and become invasive in the wild. A petite Bryophyllum NoId. Another eager propagator. 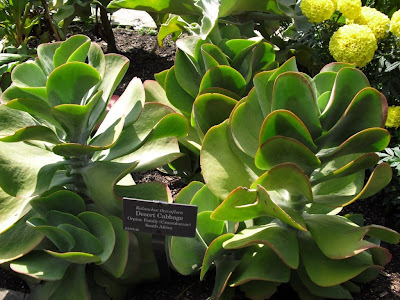 Here are some Kalanchoe pictures from the Chicago Botanic Garden from this year and last. 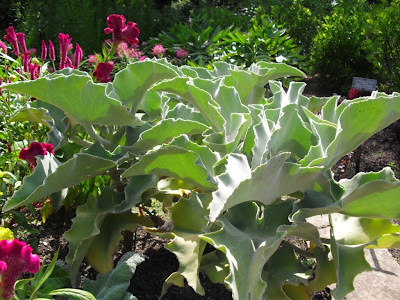 They seem to be favorites in the Sensory Garden outdoors, where plants with different textures are often featured. 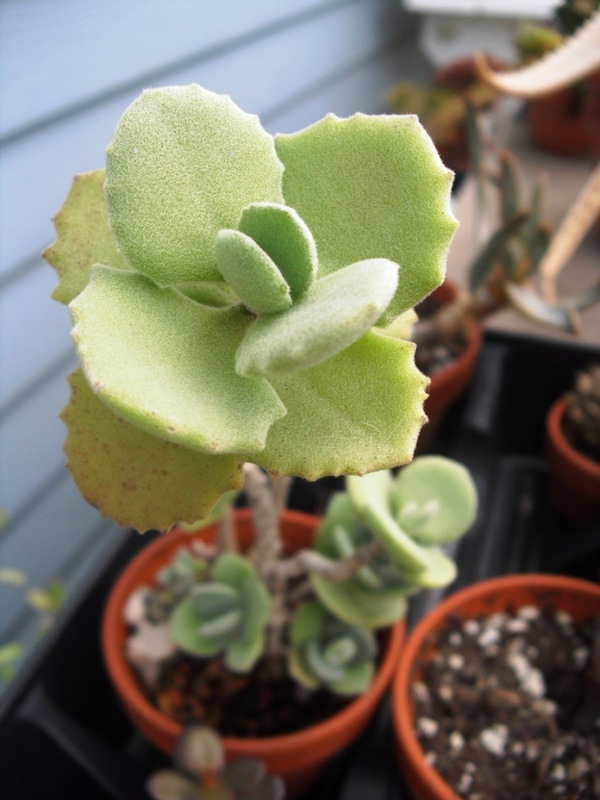 Kalanchoe beharensis 'Fang' from this year. The little protrusions on the bottoms of the leaves, which give this variety its name, can be seen in the larger view. Also from this year, in the greenhouse. 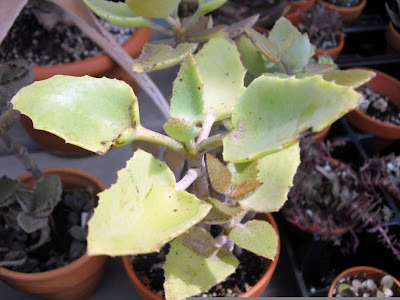 This is identified only as Kalanchoe beharensis cvv. Same variety, outdoor in the Sensory Garden last year. Though it looks smooth, it actually has a velvety texture. 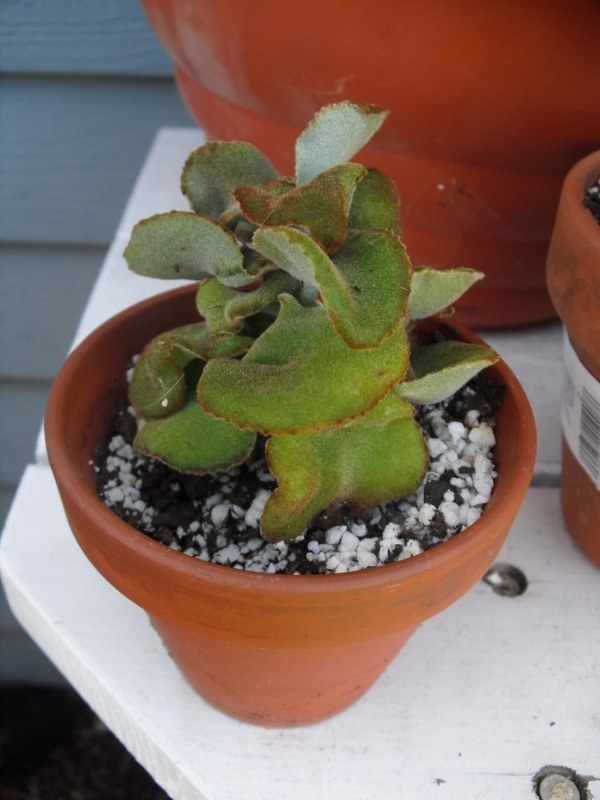 Though, to speak in fabric terms, the "nap" isn't as thick as the Kalanchoe beharensis varieties that I grow. 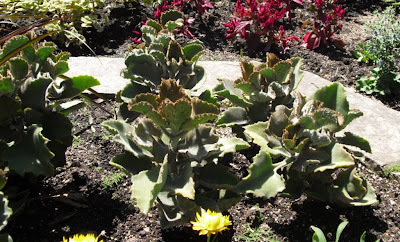 Previously posted picture of Kalanchoe thrysiflora, from last year's Sensory Garden. Beautiful, just beautiful!!! I love Kalanchoes! You know me and Kalanchoes, Karen. Thank you for the pictures - I think your unid Bryo might be of the B. fedtschenkoi sub-tribe, but which form I don't know. Again, it's lovely to see your plants. Love the shout out for kalanchoes and bryophyllums. We just picked up an orgyalis at succulent gardens a few months ago. I love succulents! There is just something so fun and whimsical about them. Mature Kalanchoe beharensis are very nice. I wouldn't want to grow any of them, but they remind me of the houseplant greenhouses at the ex-job (which were mostly, near the end of my apprenticeship, my responsibility), and I like plants that remind me of something. 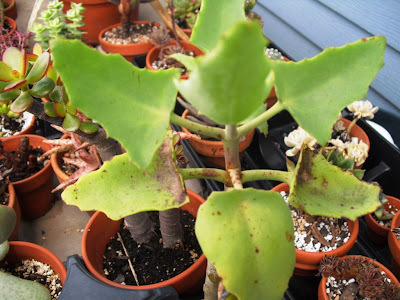 Even though they were a pain in the greenhouse, too - the Bryophyllums popping up all over the place, the tomentosas dropping leaves whenever we touched them, and the huge, heavy and evilly thorny monstrosity of a Kalanchoe beharensis. We had to move itto a different table every once in a while - took two of us to carry it, and even so, it was hard to avoid bloody shoulders and faces. Still, beharensis looks kind of neat... sort of un-real, I always said, so different from my mental image of "plant".